Are you missing something? Feeling like you need to find a way to ignite your imagination? Does it seem like you lost the sense of wonder and curiosity? Want to learn a new skill or discover new information? Fortunately, Capitol Hill Books is here to help you find those things again. We have 35,000 books in every nearly every subject and genre. 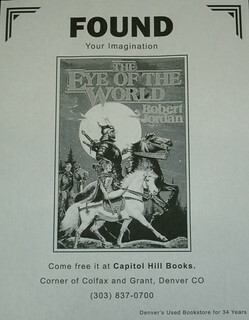 We put up a few posters around town so that you can be reminded of what you can find at Capitol Hill Books. If you came to this web site, because of one of those posters, you’re in luck. All you have to do to start your search is to click here , or simply come into our store at 300 E. Colfax, Denver, CO or call us at 303.837.0700. Start turning what was lost into what is found. 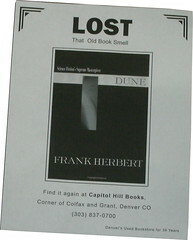 This entry was posted in Uncategorized and tagged books, Capitol Hill Books, Denver, Lost and Found, Reading. Bookmark the permalink. Haha…that is wonderful! We do get many international visitors. I can see how our books and bookmarks would get around the world. Thank you so much for sharing.